Product prices and availability are accurate as of 2019-04-12 15:30:47 UTC and are subject to change. Any price and availability information displayed on http://www.amazon.com/ at the time of purchase will apply to the purchase of this product. This 6-in-1 Fleece Hood is constructed from warm fleece fabric to provide amazing warmth, comfort and protection from the winter elements. - The one-size-fits-all easily fits, stays comfortable and is a perfect fit for men, women and children. 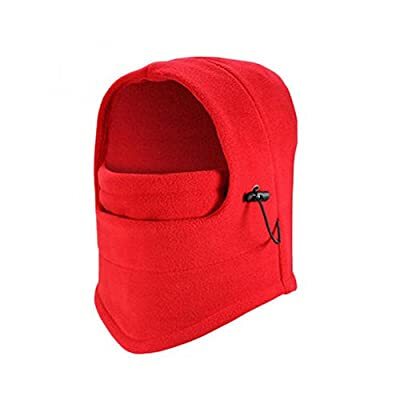 - This Fleece Hood easily converts into an open or closed balaclava, hat, scarf, half ski mask, neck gaiter or face mask! PROTECT YOUR FACE AND NECK - Warm fleece hat that covers your head,neck,and all of your face except your eyes. VERY SOFT AND COMFORTABLE - Made of a soft lucious fleece material,this balaclava headgear is perfect for long periods of use.Machine washable for your convenience. MULTIFUNCTION IN ONE - Can be suitably used as full face cover mask,hat,scarf,neck warmers or dust covers, open balaclava for protection from wind, cold and dust. ONE SIZE FITS MOST - Suitable for men or women,for head circumference 19"-24".The adjustable toggles allow the hood to fit youngsters too. MULTI-PURPOSE USE - Perfect for outdoor activities all year round: Skiing, Snowboarding, Moto and Automotive Sports, Running, Trekking, Mountain Climbing, Hunting, Working outside, Gardening.